Polly Long Mulholland, 91, of Cary, NC passed away on October 31, 2017. She was born on a farm in Lincoln County, NC on April 27, 1926, the youngest of 14 children born to Oliver Forney Long and Ella Lippard Long. Polly was preceded in death by her parents, 12 of her siblings, her husband of almost 50 years, Floyd Mulholland, and her daughter, Veronica "Roni" Mulholland Fourie. 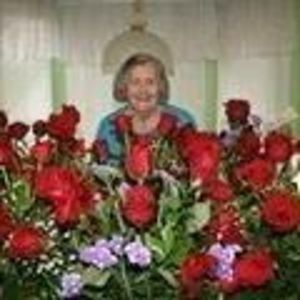 She is survived by her sister, Elise Long of Gastonia NC, her three children, Legare Woods of Cary, Skyla Carmona (Philip) of Nashville, TN, Greg Mulholland (Donna) of Lewisville, NC, sixteen grandchildren and their spouses, sixteen great-grandchildren and numerous nieces and nephews. She also leaves many old friends and many newer friends that she met at Woodland Terrace in Cary where she lived during the last years of her life. Polly grew up in Belmont, NC. She was an excellent student and was also the captain of her basketball team. That was some feat, as she was only 5'-2" tall. There, she met her future husband who was attending Belmont Abbey. They were both 13. He served in the Navy aboard a submarine in the South Pacific during World War II and they married while he was home on leave on March 8, 1946. He later became a mechanical engineer and his work brought them to Cary in 1962. They were both very active in Morrisville Baptist Church and also with Eastern Star where Polly was a member for over 50 years. Polly was also a member of the Cary Band Boosters and enjoyed accompanying the band to Switzerland in the mid-1970s. Polly lived a simple, but very rich life. She was sure and true in her faith and touched numerous lives with her kindness and compassion as she ministered to prisoners, the elderly, the disabled, and the poor. She loved her friends and she loved her family. A baby could find no better lap to snuggle in than hers. How can we say good-bye to our Mom, Mama, Mother, Mamaw, and "Uncle Polly"? She was the one who taught us how to tie our shoes and to look both ways before we cross the street. She helped us with homework and took us to buy prom dresses. She went to all of our basketball games and band concerts. She was the one who rubbed our chests with Vick's in the middle of the night when we had a cold. She was there when we got married and when we had babies of our own. She was the one we called when we needed to know how to make a certain recipe. When we make her peanut butter fudge or have her creamed rice on Christmas morning we will think of her. A walk on the beach will take us back to family vacations where she helped us fall in love with the ocean. We'll remember her great sense of humor and we'll laugh again and again at funny things that were said or done. When chicken is fried in the pan that she used, we'll hope that it will magically taste as good as hers did. But it won't. She had a special touch in everything she did that no one will ever quite match. She once told a story of Christmas as a child during the depression. The children in her family usually only received a piece of fruit or sometimes candy and maybe a paddleball, but one Christmas she also got a doll and she was thrilled. Later in the day she went with her mother to take food to a family that had even less than they did. She saw a little girl there who was about her age and realizing that this family had absolutely nothing, she gave that little girl her precious doll. That one act sums up who Polly was. She was loving, giving, gentle, kind, patient, and always thinking of others before herself. We will remember her love and cry over our loss, but we rejoice that she is reunited with her loved ones and will be spending eternity with the Lord whom she loved and served her whole life. To quote from her Grandmother's tombstone: We will not say good-bye. But on some brighter day, in some brighter place, we will bid her good morning.